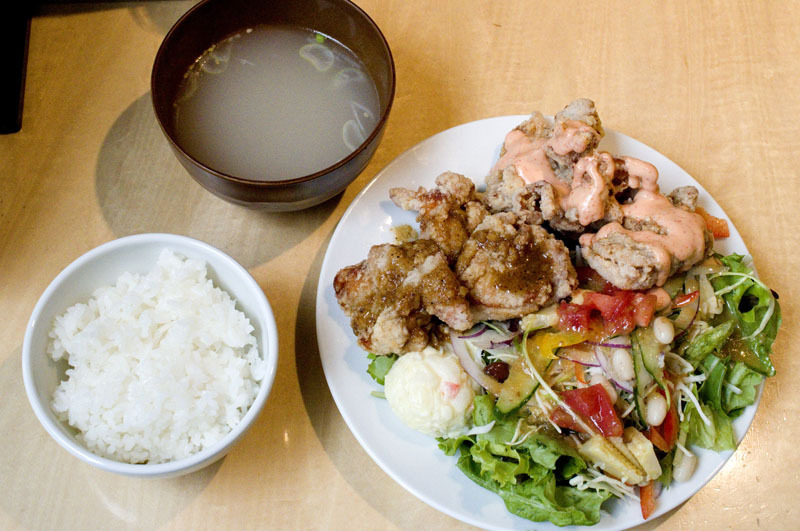 While Rang Mang’s karaage fried chicken isn’t as super-crunchy as some of its competitors, it achieves a good balance of texture and flavor – the thigh meat is juicy but not at all greasy, and the crust has just a bit of crunch to it. You can choose from more than a dozen flavorings – from simple salt or soy sauce to garlic-sansho, mentaiko-mayonnaise or curry-sauce – plus optional dips like tartar sauce or sweet chili sauce. A deluxe lunch plate (Y950) includes six pieces of chicken in your choice of two different flavors (three pieces each), plus rice, soup, potato salad and a voluminous, slightly overdressed vegetable salad. In the evenings the menu expands to include delicacies like gizzard ajillo, shoyu-marinated quail eggs, shrimp chips, and fried corn, along with lemon sours and other cocktails.